BELMOPAN, Wed. May 31, 2017–Whistleblower Alvarine Burgess took the witness stand in May 2015 in defense of herself in a defamation lawsuit in the Supreme Court filed by Hon. Edmond “Clear the Land” Castro. Yesterday, Wednesday, Burgess appeared before the Senate Select Committee inquiring into the Auditor General’s Report on the Immigration Department covering the period 2011 to 2013. 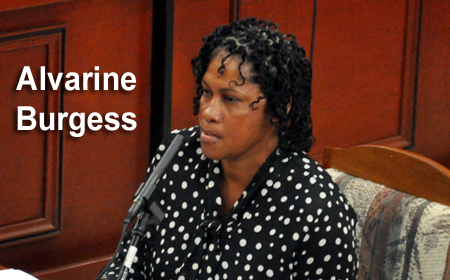 At the Supreme Court hearing, Burgess proved to be a credible witness and her testimony eventually led Minister Castro to retreat from his defamation claim. Burgess’ testimony before the Senate Select Committee was equally convincing, but this time, she was able to name two additional ministers who were involved in the visa hustling scheme that enabled Asians seeking visitor’s visas to come to Belize. In her testimony before the Senate, Burgess narrated how she became involved in the visa hustle that was being spearheaded by Cabinet ministers. Burgess told the Senate, just as she had testified in the Supreme Court, that she paid the Belize Rural North area representative Hon. Minister Edmond Castro $2,000 per visa that he recommended. Chairman of the Senate Select Committee Senator Aldo Salazar questioned Burgess about how she became involved as a facilitator and immigration agent. Burgess told the Senate Committee that she met a police officer named Rochelle Chan through a cousin of hers. Chan is a brother-in-law of former Minister of State in the Ministry of Immigration and Nationality, Elvin Penner, former Cayo North East area representative. “Me and Mr. Chan sat down at a place in Belmopan. We were in Mr. Chan’s vehicle. He asked me if I knew anybody in the Immigration Department. I told him that I did not know anybody in the Immigration Department. I told him that I know people high-up. He said, ‘You want to make some money?’,” she related. Burgess said she asked Mr. Chan what he meant, and he said that a considerable sum of money could be made by obtaining immigration visas for certain individuals. Burgess explained that at the time the offer was made to her, her late husband was ailing from a heart condition that required him to visit a doctor in Merida, Mexico, on a regular basis. Burgess went on to explain that she did not see anything illegal about obtaining the visas until she heard the Prime Minister saying it was illegal. After the Won Hong Kim passport scandal broke in September 2013, Prime Minister Barrow, at a press conference in November 2013, admonished his ministers to stop the hustling at the Immigration Department. “If you are doing it, for God’s sake, stop it!” the Prime Minister revealed at a press conference. At that press conference, PM Barrow said that if there was anything that could bring the government down, it was hustling at the Immigration Department. Burgess said she never calculated how much money she had made, and that Chan was the one who dealt with all the money issues. “I was the last one to collect, so I was taking a risk,” Burgess said. She explained that she took the passports to the Immigration office and they would tell her when to return to pick them up when the visas were ready. “Mr. Chan would be right outside, and I would give him the receipts,” she said. The United States Embassy presented her with a recording of herself, Castro and another person whose name she could not recall. “It was like two recordings,” Burgess said. Chairman Salazar asked Burgess, however, if she was aware that the US Charge d’Affaires had denied the existence of the recordings. Burgess went on to mention that her meetings with Hon. Castro were all about money. She noted that when the Auditor General told her that they wanted to speak to her, Burgess told them that she would come with her lawyer, but they never got back to her. Burgess explained that for every trip that she made to Belmopan at the Immigration Department, she would collect $1,500, and she usually made 2 or 3 trips per week and did that every week for about 6 months. When Burgess was asked by Chairman Salazar if she had kept the money that she made in a bank account, Burgess said she never had time to deposit the money, because she had to take her husband to the doctor in Merida on a regular basis. “These ventures were assisting me to take care of my husband, six grandchildren and my mother,” said Burgess. Burgess said that there was a quota system but she never learned what the size of the quota was for each minister involved in the visa recommendations. “My understanding of quota systems from Mr. Castro is that the ministers who are procuring visas have a certain amount that they can do for the month,” she said. Business Senator, Hon. Mark Lizarraga, asked Burgess if Minister Castro had told her about the quota system. 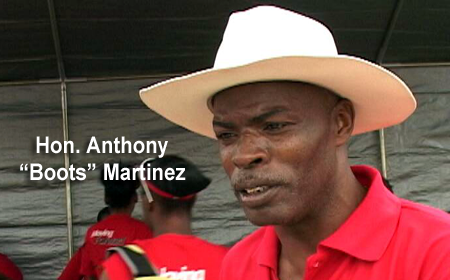 “Because at that time Minister Castro was not here; he was not in the country,” Burgess offered. “I only went to Mr. [Anthony “Boots”] Martinez twice and Mr. [Erwin] Contreras once, which would be 2 or 3 days the most,” Burgess answered. “And in terms of payment of money, what was the arrangement?” Burgess was asked. Burgess said that the other minister got the same $2,000 per visas, but did not do a lot. She was referring to Minister “Boots” Martinez. Burgess said that she did not pay Hon. Contreras, because he was her husband’s friend. “And this you told to the United States Embassy, you said?” Senator Courtenay asked Burgess. “You never said that on Channel 5?” Chairman Salazar asked her. Burgess said that she had mentioned two other ministers when she was interviewed by Dickie Bradley, but never said who they were. “Yes, I said that when I was talking to Dickie Bradley, but I never mentioned their names,” she said.